Celebrate the season with our Happy Hanukkah foil stamped holiday photo cards. Matching blank envelopes are included. Photo cards come with a fully designed card back as shown. Size of photo cards are.. Celebrate the season with our foil stamped Hanukkah photo cards featuring your favorite photo framed in gold foil. Matching blank envelopes are included. Photo cards come with a fully printed card.. Celebrate the season with our foil stamped Chanukah photo cards featuring your favorite photo framed in silver foil. Matching blank envelopes are included. Photo cards come with fully printed card.. 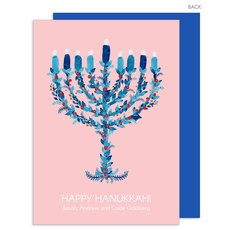 Send your holiday wishes to friends and family with this set of pink menorah flat Hanukkah cards. Flat printed in ink color and typestyle of your choice. Full back design as shown included. Size 5" x.. 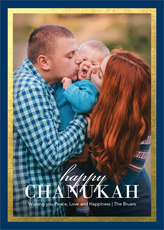 Celebrate the season with our foil stamped Chanukah photo cards featuring your favorite photo framed in gold foil. Matching blank envelopes are included. Photo cards come with fully printed card.. 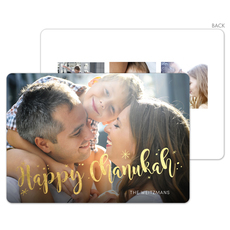 Celebrate the season with our foil stamped Hanukkah photo cards featuring your favorite photo framed in gold foil. Matching blank envelopes are included. Photo cards come with fully printed card.. Celebrate the season with our foil stamped Hanukkah photo cards featuring your favorite photo framed in silver foil. Matching blank envelopes are included. Photo cards come with fully printed card.. Celebrate the season with our holiday photo cards. Matching blank envelopes are included. Photo cards come with a fully designed card back as shown. Size of photo cards are 5" x 7". Flat.. 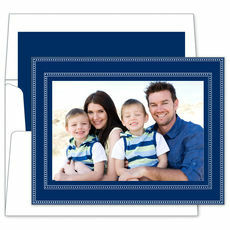 Celebrate the season with our foil stamped Hanukkah photo cards featuring your favorite photo framed in navy foil. Matching blank envelopes are included. Photo cards come with a fully printed card.. Send your holiday wishes to friends and family with this set of lovely flat Hanukkah cards. Flat printed in ink color as shown with your choice of typestyle. Full back design as shown included. Size.. Celebrate the season with our foil stamped Hanukkah photo cards featuring your favorite photo framed in blue foil. Matching blank envelopes are included. Photo cards come with fully printed card..
Set of 25 flat stylish and rich holiday cards. The greeting and the personalization is imprinted with a letterpress method on luxurious 100% cotton stock. Card size is 5.5" x 8.5" Your choice of.. Send your holiday greetings to friends and family with this set of Hanukkah photo cards which features your favorite photos. Matching blank envelopes are included. 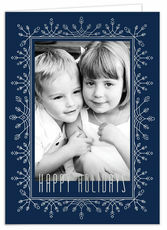 Photo cards come with a full printed..
Beautiful and unique holiday invitations to celebrate the season in style. Includes matching blank envelopes. Card size is approximately 7" x 5". . Imprint is flat printed in white ink..
At Hanukkah, as at all Jewish festivals, the strength of family ties is most important. Our beautiful custom Hanukkah cards are a great way to connect with friends and family, near and far. Whether you observe the eight-day Festival of Lights or simply want to send holiday greetings, these beautiful cards let your loved ones know they're always in your heart. Many cards offer a die cut option including medallion shapes, rounded corners or scalloped edges. We do not charge extra for this service which is our gift to you. 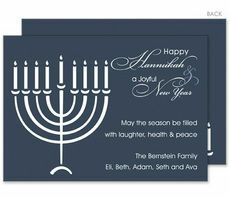 Our personalized Hanukkah cards allow you to send touching correspondence to your friends and family members. 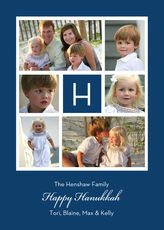 On our photo cards, you can upload one or more photos of your family that will be printed within the design you select. 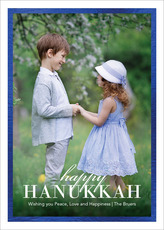 Another lovely option for your Hanukkah cards are our navy Festival of Lights cards. The front is split between a photo of your choice and a lit menorah. Our cards come with matching envelopes and provide an optional return address printed for a great finished product ready to be mailed. For a modern twist on traditional Hanukkah cards, you might consider our blue with silver lattice design. The shape of this card is a die-cut scroll pattern. The message of "Happy Hanukkah" is printed on the cards and you can personalize them with the names of all your family. 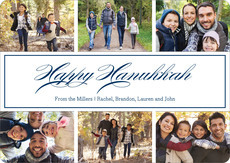 If you would like to share multiple photos of what your family has been up to over the past year, try our little miracles Hanukkah card design. This card measures 5 by 7 inches and has space for six of your most precious photos. You can even personalize the card with your family name and the year. We have an assortment of styles and greetings to fit all your holiday needs. 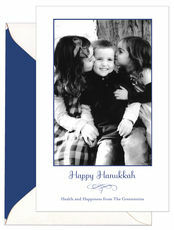 Many of our Happy Hanukkah cards can be customized with family photos along with family names and personal messages. Use one image or up to six. 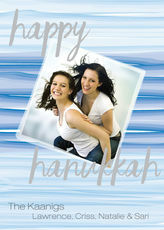 We also have cards with graceful classic holiday designs that do not require a photo include menorah images and more. Create a memory that your family and friends will cherish and show off your holiday spirit. Envelopes are included with all holiday cards, and return address printing or matching address levels are offered on most items. Our website makes it very easy to upload your favorite picture and create your custom design right from your computer or tablet. We even provide guidelines on how to choose just the right pictures so that your Hanukkah photo cards will look their best. Make your card stand out from the pack this year by giving it your personal stamp. 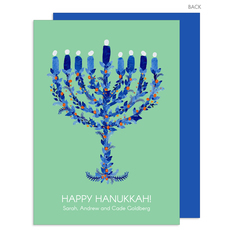 With our large selection, you're sure to find the perfect Hanukkah card.